It doesn’t seem that long ago that I was rocking out on the Xbox with my collection of plastic instruments to songs that I wish I really knew how to play. I used to regularly have friends over and spend hours enjoying band-simulation games, but over time we did it less and less, and started to find it cumbersome to set up all the instruments every time. 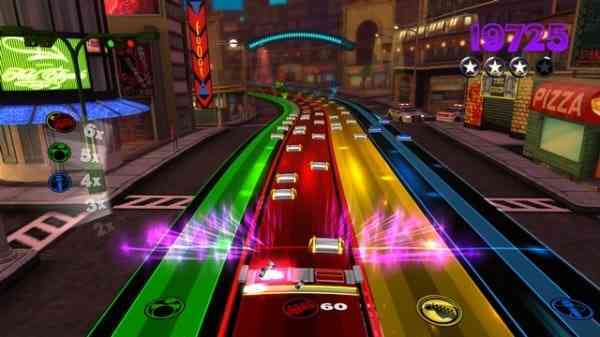 Well, Harmonix has found a way to pull back me back to the music of Rock Band without need of the instruments: Rock Band Blitz. Wait a second, a Rock Band game that doesn’t use the instruments? Yes, a standard controller is all you need and after some extended play it works surprisingly well. 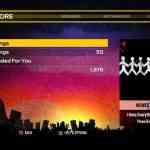 Rock Band Blitz layout is rather straightforward, offering a simple interface to get to the music selection and playing. 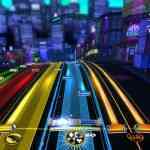 Once in a game, much like in previous Rock Band games, the songs are broken down into separate audio tracks like drums, lead guitar, bass guitar, vocals, and keyboard. 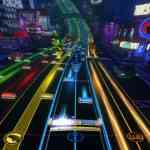 However, since it’s just you playing, you move your “active zone” left and right with the controller to select a track you want to focus on, in a way that harkens back to earlier Harmonix games like Frequency and Amplitude. 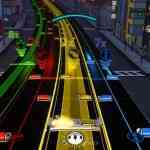 As notes flow down the screen, you activate the left or right notes with correct timing to score. Triggering enough notes will raise that track’s multiplier bonus. For the highest scores, your goal is to get each track to the max multiplier level before the checkpoints scattered through the level. There is a strong emphasis on getting a high score as your scores on each song are always being compared with your Xbox Live Friends’ and other “rivals” on the Leaderboards. Even as you play a song, you can compare your score against your friends’ by glancing at a meter on the right, and the game proudly announces when you beat them. You can also directly challenge a friend to a “Score War”, where you both play a specific song for a set amount of time in an attempt to get the highest score. 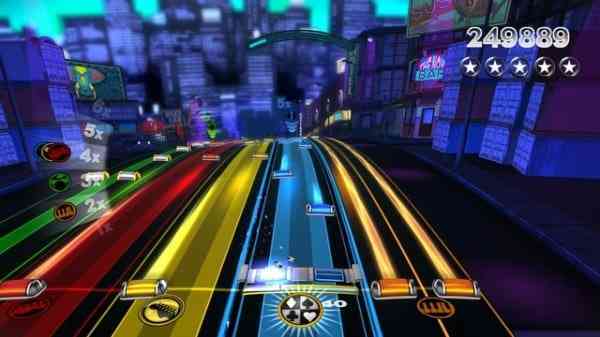 Also for you Facebook junkies, Harmonix has set up Rock Band World as a Facebook app designed to run alongside the game. 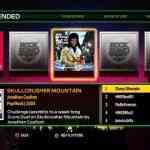 Players can enter their Gamertags (or PSN IDs) into the app to start Score Wars or complete various goals with friends. 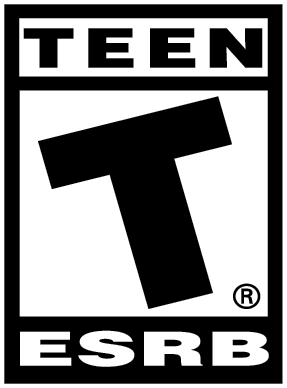 Performing well, winning “Score Wars” and progressing through the song list nets you “Cred” – which is essentially your “XP” that will unlock power-ups and Coins that are used to pay for the use of those power-ups in gameplay. There is a good assortment of power-ups. Some power-ups require you to collect energy from white notes in the game. Once you have enough energy you can deploy Overdrive power-ups such as: the “Bandmate”, which plays a track for you while your energy lasts, so you can focus on another; the “Shockwave”, which sends a blast of energy down the track, gaining you bonus points for every note it hits; the “Bottle Rocket” which fires a blast of energy up the track destroying notes, netting you points and helping you reach the multiplier before the checkpoint; and the “Jackpot” power-up starts a run that will help you earn three times the points if you can play a section of notes perfectly – but you need to be perfect, or you lose everything. 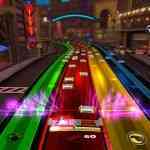 The last Overdrive power-up you can find is called “Road Rage”, which has the car from Rock Band 2 tear down the track, taking out notes on its way and scoring you a ton of points. There is also another type of power-up that affects the notes on the screen, turning certain ones purple. Hit these special notes right to trigger their special effects. Blast Notes explode and takes out all notes in its radius for points. Flame Notes start a fire that spreads faster and faster – if you can keep up, you can gain a lot of points. The Pinball Notes launch a huge pinball down the track that awards points for every note it hits, but when it bounces back you have to position your scoring area in front of it to send it back up the track. A Runaway Note releases a chain of notes down the track that you need to keep up with by playing well. If you capture the lead note you get the total points it collected while it was on the run. Finally, there are instrument bonuses that you can unlock. 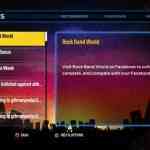 You can find Super Drums, Bass, Guitar, Vocals and Keys that grant you double point bonuses to a single instrument track. 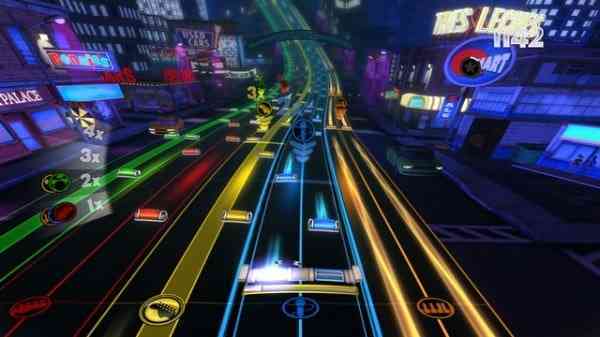 In terms of the games visuals, Rock Band Blitz is beautiful to look at. 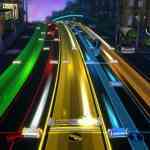 The tracks are like lanes on a road, and cityscapes scroll by as the road winds lazily up and down hills. The colours are bright and saturated, sporting a neon look that would fit in with any big city’s entertainment district. The track ends at a theatre surrounded by a cheering crowd. I found the visual style more interesting than the static note-tracks of past Rock Band games, and certainly works well most of the time, but I found I had trouble telling what notes were coming up next in a few spots, and ended up breaking my combo. I found that I could play the game for a good length of time and not get burned out on the look or have eye strain like other rhythm music games have done to me in the past. But I still had to remember to blink occasionally! 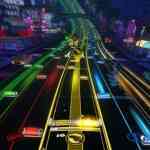 Overall, I had a blast playing Rock Band Blitz on XBLA. I never would have thought you could have this much fun playing a music based game without the plastic instrument controllers. Playing Rock Band Blitz with the standard Xbox 360 controller was a hoot as the fast gameplay, enjoyable set list and the ability to play your existing Rock Band tunes from your library (for a price) makes Rock Band Blitz a solid buy for fans of the franchise. Granted, Rock Band Blitz lacks some of the substance from previous Rock Band games but when you take into account its price point, Rock Band Blitz is money well spent.